The NSW Court of Criminal Appeal recently delivered a decision about a court's power to correct judgments, and more particularly, the reasons for judgments, in R v Jones; R v Hili (No 2)  NSWCCA 195. ‘Judgment’ differs from ‘reasons for judgment’. The substance of reasons for judgment may properly be amended only until judgment or sentence is recorded: R v Jones; R v Hili (No 2)  NSWCCA 195 at  – ; Fletcher Construction Australia Ltd v Lines MacFarlane Marshall Pty Ltd (2001) 4 VR 28 at  – . Errors and other matters such as wording and grammar may be properly changed so long as they do not in substance become different reasons and are done within a reasonable time after judgment. The extent to which judges of a superior court may properly alter reasons for judgment subsequent to their being given may depend not only on whether the changes are sought to be made before or after judgment has been entered, but also on the nature and extent of the alterations. A litigant is entitled to a decision that is based on reasons that have led the judge to that conclusion. It would obviously impede the proper administration of justice and work unfairness to the parties if the judge could, at a later time, give different reasons for the decision which were crafted after judgment had been pronounced. Thus, the courts limit the rights of a judge to change the reasons, but they do so consistently with the practical requirements of justice. In the case of a superior court of record, judgment is not relevantly finalised until it is entered in the records of the court. Hence, until that occurs, the judge can recall the order and the reasons and make a different order and give different reasons — Smith v Australia and New Zealand Banking Group Ltd, unrep, NSW Court of Appeal, 21 Nov 1996; Sherpa v Anderson, unrep, NSW Supreme Court, 14 Oct 1993; Mulvena v GIO NSW unrep, NSW Court of Appeal, 16 Jun 1992; Re Harrison's Shares Under a Settlement  Ch 260 at 284. But once judgment is perfected the judge cannot, in substance, re-write the given reasons so as to give different reasons for the decision or, in the words of Willmer LJ in Bromley v Bromley (No 2)  P 111 at 114, “put a different complexion on the issue in dispute”. In Nakhla v McCarthy  1 NZLR 291 Woodhouse J at 296 said that in general a judge cannot alter the reasons so as to modify or change the effect of the judgment once it has been perfected. Similarly, in Bank of Nova Scotia v Province of Nova Scotia (1977) 23 NSR 357 at 357 – 8, the Nova Scotia Court of Appeal held that once judgment is entered, the substance of the reasons cannot be changed; if correction is needed it can only be made by a higher court. An example of a case where it was held that the judicial officer had impermissibly changed the reasons for the decision is Lam v Beesley (1992) 7 WAR 88. In that case, the magistrate announced the verdict and convicted the defendant for reasons which he gave orally. He then sentenced him and subsequently published “Reasons for Decision” in which he made a finding of fact that was inconsistent with his earlier finding as expressed in his ex tempore reasons. On appeal, Owen J held at 92, 94 – 5, that the two findings could not stand together and that, in the circumstances, the magistrate was not entitled later to formulate reasons which were, in substance, different from those which had been pronounced. His Honour held at 95 that, in the circumstances, the conviction could not stand. More recently, in Todorovic v Moussa  NSWCA 419 leave to appeal from the decision of the District Court was granted by the New South Wales Court of Appeal seemingly for the reason that after delivery of an oral judgment the District Court judge inserted in his corrected judgment an additional sentence, namely, “I do not accept [X] as an accurate witness”. It would appear that there was no other reference in the reasons to the acceptability or otherwise of X‘s evidence which in fact was corroborated by other evidence. Furthermore, it was at least arguable that the addition of a broad statement that was unconnected with the rest of the reasons, namely, that the judge did not accept the witness, went beyond what could be done when revising an oral judgment. It seems, however, that ordinarily, even after judgment has been entered, it is permissible to change the given reasons provided that in substance they do not become different reasons as a result of the changes and provided the alterations are made within a period that is not unduly long in all the circumstances. Thus, it is clear enough, for example, that a judge can alter the transcript of the reasons at any time to remove an error brought about by an administrative act which related to the compiling of the reasons — Nakhla v McCarthy  1 NZLR 291 at 296; Bromley v Bromley (No 2)  P 111 at 114. In Bar-Mordecai v Rotman  NSWCA 123 it was held that ex tempore reasons can be altered by a judge provided the substance of them is not changed, nor are the orders which they sustain. There is no reason in principle why a like position should not apply to written judgments that have been published. It is common practice for judges to make changes not only to reasons that have been given ex tempore, but also to written reasons and in the latter case to make changes to them between the time they are published and when they become the subject of an authorised report. For example, in Duke of Buccleuch v Inland Revenue Commissioners 1 AC 506 Lord Reid and Lord Guest did not question the correctness of the action of Sankey J in deleting in the version that was later published in the Law Reports  2 KB 735 a paragraph of his reasons in Earl of Ellesmere v Inland Revenue Commissioners, which had been published in the Law Times (1918) 119 LT 568. In fact, Lord Reid considered at 527 that Sankey J was wise to have deleted that paragraph, given that his Honour must have had a reservation about its correctness: Fletcher Construction Australia Ltd v Lines MacFarlane Marshall Pty Ltd (2001) 4 VR 28. Sentencing Act 1991 s 104A provides a statutory power to amend clerical errors in sentencing records up to 14 days after judgment. In addition, all courts have inherent jurisdiction to correct a judgment or order that does not reflect what the court pronounced and may correct their own records, especially if a clerical error is made by an officer recording the judgment or order: R v Saxon  1 VR 503 at 505 – 8; R v De Zylva (1988) 38 A Crim R 207. Both this statutory and common law power are sometimes called the “slip rule”. However, if the entry is consistent with an order announced in court and which the court intended to make, it is not a slip and cannot be amended: Kelly v Von Einem (1995) 84 A Crim R 37. 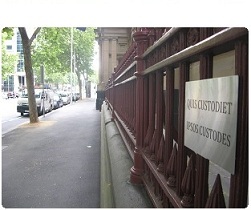 Sentences ordered without jurisdiction are void and unenforceable: Nollen v Police (2000) 78 SASR 421. In such cases, there is nothing to correct. The Court is not functus officio and is entitled to have the offender re-presented for sentencing: R v Judge Bland; ex parte DPP  VR 225 at 229; R v Brattoli  VR 446 at 447 – 448. A court may correct a sentencing order before it passes into the record. In the Magistrates’ Court the order passes into the record when recorded in the court register: Magistrates’ Court Act 1989 s 18. In the County and Supreme Courts, this occurs when the judge signs the sentence recorded on the back of the indictment: R v Brattoli  VR 446; R v Judge Bland; ex parte DPP  VR 225; R v Saxon  1 VR 503 at 505 – 8. This is different from when the accused is found guilty, which occurs either when they enter a plea or the jury delivers its verdict: Criminal Procedure Act 2009 s 253B. Why am I posting this on a summary offences blog? An excellent question! Partly because I reckon it's useful, but more because it's quite common for judicial officers to correct errors in sentencing records — particularly in the Magistrates' Court, where the Court Link computer system sometimes results in temporary triumphs of form over substance. And also because as the jurisdiction of summary courts has increased in recent years, bringing with it increasingly complex cases, we're seeing more magistrates provide written reasons for their decisions, and I expect this will only increase in the future. Don't hold your breath for VMC decisions. Some magistrates had a go at the start but there has been nothing new on AustLii since mid year. Anon, I hadn't heard of John Tarrant's book: that's a good find. Might add that to the pile on my to-buy-and-read list.